The book series tells about the lives of six fugitive children, Max, Fang, Iggy, Gasman, Nudge, and Angel, known collectively as the Flock. Created in a laboratory called the School, they underwent scientific experiments that rendered them 98% human and 2% avian. Throughout the series, they avoid capture by the scientists that created them and the scientists' other creations. Fang is 14 years old, nearly 15. He is second-in-command of the Flock and Max's best friend. He is only a few months younger than Max. He's a quick learner, but most of his abilities are definitely superhuman. Probably because he is a human and bird hybrid. He's computer savvy, not that that will help him much at the Mansion. Fang, besides being able to fly, is able to virtually disappear by staying very still and quiet. He is somewhat stronger than the rest of the flock, often sustaining near-fatal wounds, as in books one and two. He also eventually develops gills. He can almost match Max in speed by flying at up to 250 mph. Nope, because his wings are attached. Fang almost always wears dark clothing and always seems to be sneaking up on Max. He has dark hair and eyes with olive skin. 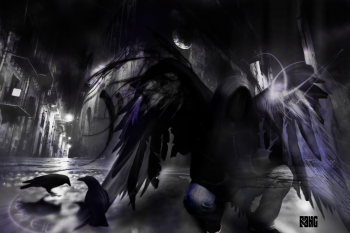 He is believed to have DNA of a raven because of his black wings that have a purple shimmer. His PB is Munro Chambers. In The Angel Experiment, he found out that the School took him after he was born. His mother had put him up for adoption and was later told that he had died. Fang was bitter about the fact that his mother left him, and decided that he didn't want to find his mother, because she wasn't much older than his own age when she had him, and he suspects she's a crack addict. He suspects that her drug addiction is the reason why his mother put him up for adoption in the first place. He is somewhat reserved, but cares deeply about the Flock. He is usually very silent, and seems quite mysterious, always hiding his feelings. He prefers the written word to speaking; he runs a blog about the Flock's adventures. Not that he doesn't speak ever. He's just not very verbose. Affiliations (to a particular group, of origin, or not): The Flock.